The Marsh Damsel Bug is a slender, brownish damselbug, which is short-winged usually. Very rarely full-winged animals are seen. It does have a look-a-like: the Reed Damsel Bug (Nabis lineatus) and both can be found in the same habitat. Usually you can tell them apart by looking at the three length stripes running over the body of the Marsh Damsel Bug. The Reed Damsel Bug has these three lines as well, but they appear to be part of just one sign running over the body. The middle line is clearly interrupted, while in the Marsh Damsel Bug the line is hardly interrupted, if at all. Alas, some animals show no lines, or just one, which is true for both species. In this case you have to measure them. The Marsh Damsel Bug is the smaller one, reaching a length of 7 to 9 mm. The Reet Damsel Bug is bigger, measuring 9.5 to 12 mm. Of the two species the Marsh Damsel Bug is much more common. The Marsh Damsel Bug can be found in moist areas: marshes, reetlands, moist forests and swamps. Both larvae and adults hunt for insects or their larvae and small spiders. Their favourite food seems to be flies and their larvae. The eggs overwinter and the nymphs appear by the middle or end of May. By the end of June the first adults are seen. They are quite long-lived, for they can still be around in October. 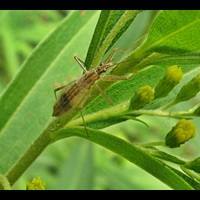 The Marsh Damsel Bug lives in the moderate parts of Europe and Asia and has accidentally been introduced in Canada. It is common in the Eastern parts of Canada and the USA. Common and widespread all over the UK and Ireland.